Speaking of religious landscapes (see my first blog) there can be few more striking than Fushimi Inari on the edge of Kyoto. This is a ‘No.1 attraction in Japan’ sort of place with hordes of visitors, but as it is open all the time we managed to get there at 8am before the crowds. 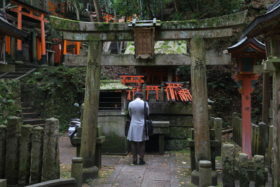 The main Shinto shrine sits at the foot of Mt Inari (233 metres/765 feet) and is dedicated to Inari, the god of rice. However since rice was the original currency in Japan he is also god of commerce and prosperity generally. The 10,000 Torii that form a vermilion avenue to the summit have been subscribed by companies, institutions and wealthy individuals. To walk up the mountain along this route is an extraordinary experience. 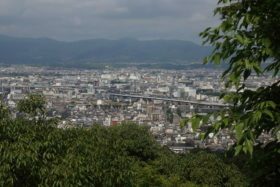 Half way up the line of Torii gives way momentarily to reveal a panoramic view of Kyoto, but the summit itself is given over completely to a cafe and gift shop complex, surrounded by the dense cedar woodland that covers the whole mountain. 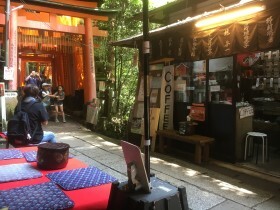 Much of Mt Inari is owned by the shrine, but not all of it, and many of the extremely welcome tea houses and other enterprises are owner occupied, adding to the mountain’s air of informality. Numerous ‘desire line’ paths lead off the main route, most terminating at small satellite shrines of greater or lesser importance within the mysteries of Shintoism. 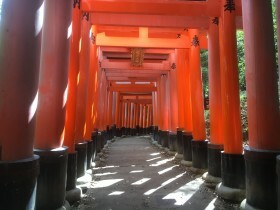 A 1997 paper by Karen A. Smyers  stresses the individual nature of pilgrimages to Fushimi Inari. The shrine offers many opportunities for worship, but there is no established rule for the various austerities and purifications that people come to practice. A visitor may stay for the day, or for several weeks, but the idea of collective worship is largely absent here. From the landscape point of view how do you interpret a site like this whose purpose is entirely religious? In Prospect-Refuge terms (see my first blog) you could say that the multiple shrines, semi-enclosed walkway and ‘concealed ‘ summit produce a landscape completely given over to the idea of Refuge. The shelter offered naturally by the woodland is reduplicated and reinforced by the protecting arches of the constructed avenue and the enclosures of the wayside shrines. The mountain cocoons its human visitors, allowing them a single Prospect of the great world beyond (from the viewing platform) before taking them back under her wing. It’s also worth pointing out that Mt Inari provides an immersive pilgrimage experience without the need to reach a linear goal, unlike (say) the Camino de Santiago in Spain. You climb and descend the mountain, but all points on the trail offer equivalent possibilities for worship and contemplation. Nature coexists with the constant stream of visitors and pilgrims. Although the foxes are made of stone (Inari’s messengers), there are wild boars to beware of, large nocturnal spiders and myriad birds of the forest.